Your kitchen looks fabulous – strategically placed cookbook, fruit bowl brimming with perfect apples and everything coordinating within your chosen colour palette – shame about all those gaudy plastic magnetic letters covering the fridge. No need for the kid’s fridge magnet fun to ruin a designer kitchen, thanks to Fin + Roe. Created from Fin + Roe’s sublime colour palette, badge style alphabet magnets are available in upper and lower case letters, each edged in a modern, geometric pattern. Sets contain one of each letter in the alphabet plus a customised magnet with your choice of text, colour and pattern – a perfect personalised gift. Fin + Roe also have a sensational range of customised stationery featuring their signature patterns and colour range. 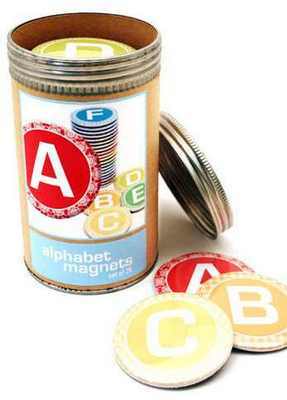 Alphabet and number magnets are US$36.50 per set. Fin + Roe will ship internationally by arrangement.